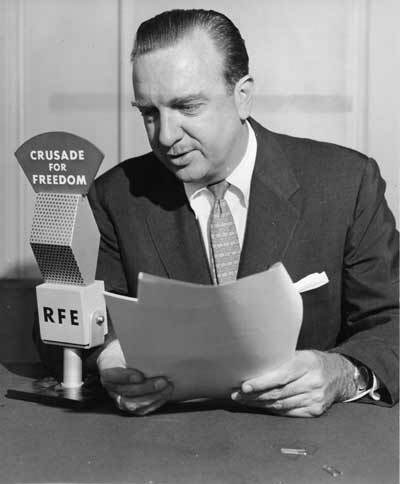 The Peerless’ Prognosticator is ON THE AIR!!! Happy New Year, Caps fans, welcome to 2018, a year that is still a blank slate, full of promise and hope. The Caps begin the 2018 portion of their quest to win a championship with a visit to an old adversary, the Carolina Hurricanes, a team with which they will renew acquaintances three times in the space of ten days starting with Tuesday night’s game in Raleigh. Washington will be looking to snap a three-game losing streak on the road (0-1-2) against a team that has not lost on home ice since the day after Thanksgiving. Since that 5-4 loss to the Toronto Maple Leafs, the Hurricanes are 6-0-0 at PNC Arena, the only team in the league to go undefeated on home ice in games since November 24th. In that six-game home winning streak, 11 different skaters have shared the 17 goals scored (2.83 per game team average). Sebastian Aho leads that group with four goals, two of them game-winners. Aho is building off a solid rookie season in 2016-2017 (24-25-49) in which he finished third among all rookies in goals and fifth in points. With 11 goals in 38 games overall, he is on a pace to match last year’s 24 goal total, while his 29 points puts him on a pace to finish with 63 points. Aho brings a four-game points streak overall into this game (4-2-6, plus-2). According to the Hurricanes media guide, his nicknames are “Seabass” (Sebastian…”seabass”…okay) or “Fish” (Aho…ahi?). Okay...clever. He has been a thorn in the side of the Caps in his brief career, going 2-4-6, plus-1, in four career games against Washington. Former Capital and second-tour Hurricane Justin Williams has not been among the leaders in scoring in the Hurricanes’ home winning streak, but he is among the overall team leaders in points this season (24/fourth). Williams, who left the Caps this past off-season to sign a two-year/$9 million contract with the Hurricanes, is on a pace to finish with more points this season (52) than he did with the Caps last season (48). What seems unlikely is that he will continue the three years of improvement in goal scoring (18-22-24) that he began with Los Angeles in 2014-2015 and carried over into his two years in Washington. With seven goals in 38 games so far, he is on a pace to finish this season with 15 goals. On December 23rd, Williams became the 52nd player in team history to dress for 300 games in a Carolina jersey and now stands 50th in total games played for the franchise (303). Williams comes into this game in a bit of a dry stretch, recording only one assist in his last six games overall and without a goal in his last seven contests. He is 14-20-34, plus-11, in 43 career games against the Capitals. Cam Ward has almost every meaningful goaltending record in the history of the franchise dating back to the Hartford Whaler days. He has appeared in more than twice as many games (639, fifth among all active goaltenders) as second place Arturs Irbe (309), won twice as many games (305, fifth among active goalies) as Irbe (130), and has 25 shutouts (to 20 for Irbe). His goals against average (2.69) ranks third among franchise goalies with at least 100 appearances, trailing Kevin Weekes (2.41 in 119 games) and Irbe (2.49), while his save percentage (.909) trails only Weekes (.912). This season, if he has not quite enjoyed a renaissance, Ward has returned to a more respectable level of performance than he had the last five seasons in the pure act of stopping pucks. His .917 save percentage is his best since he finished the 2010-2011 season with a .923 save percentage (perhaps not coincidentally, the last season in which he received votes for the Vezina Trophy, finishing seventh). The odd part of his season is the workload. He has 14 appearances so far this season with a 10-2-1 record (one no-decision). Perhaps the result of the team signing Scott Darling to a 4-year/$16.6 million contract (Darling is 8-11-0, 2.88, .896 in 25 games), but Ward is making a case for more work. In 39 career games against Washington, Ward is 17-16-5, 2.68, .914, with four shutouts. 1. On Carolina’s 2017 report card it might say, “works and plays well with others.” They have the fewest penalty minutes per game in the league (6:07),m fewest total penalties (108, 20 fewer than Columbus through December 31st), and fewest major penalties (three, tied with Vegas). 2. As a result of their ability to avoid penalties, the Hurricanes are the only team in the NHL to have faced fewer than 100 shorthanded situations (94). They have spent just 157:18 killing penalties, the lowest amount of shorthanded ice time in the league. And watch out in the third period. Carolina’s special teams time difference of plus-34:44 ( 62:15 in power play time, 27:31 in penalty killing time) is tops in the league. 3. The Hurricanes do not win blowouts. Their three wins by three or more goals is fewer than any other team except Arizona (2) and Buffalo (none). 4. Carolina has out-shot opponents a whopping 29 times in 38 games so far this season. Only St. Louis has out-shot opponent more often (41 times). 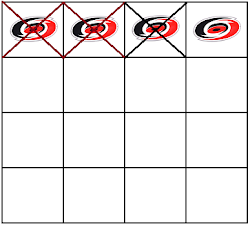 Not that it matters to the Hurricanes that much, since they won barely half of those 29 games (15-9-5). 5. Boil this down to one thing for the Caps…score first. No team has fewer wins when allowing the first goal in games this season than Carolina (three, tied with three other teams). 1. As the old year ends, some odd facts… The Capitals had 26 different players record at least one goal in calendar year 2017, from “Alzner” to “Winnik.” The NHL being a turnover sort of league, it’s not all that surprising that neither player is still with the team. 2. Three Capitals played in all 87 regular season games in 2017 – Alex Ovechkin, Evgeny Kuznetsov, and Dmitry Orlov. It will not escape the careful reader that all are Russian. Not indicative of anything, just interesting. 3. Oh, and 87 regular season games in 2017. Is there nothing that will not remind this franchise of "that team?" 5. Ten rookies dressed for the Capitals in 2017: Jakub Vrana (48 games/12-7-19, plus-6), Chandler Stephenson (32/2-7-9, plus-6), Christian Djoos (31/3-5-8, plus-8), Madison Bowey (32/0-8-8, minus-2), Zach Sanford (6/2-0-2, plus-1), Nathan Walker (7/1-0-1, plus-1), Garrett Mitchell, one game, no points), Liam O’Brien (four games, no points), Riley Barber (three games, no points), and Travis Boyd (two games, no points). In the run-up to the 2012 entry draft, Teuvo Teravainen was thought to be among the most skilled skaters available. 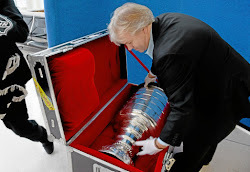 He was “a player with outstanding hockey sense and great overall skill (NHL Director of European Scouting Goran Stubb)”…”smooth, intelligent with great two-way efforts. He has a great one timer but can also really find his teammates well from the perimeter and off the rush. A very dynamic threat at all times (ISS Hockey’s Ross MacLean)”… and “an impressive skater with a great first few steps who can get to a dangerous top speed that puts defenders on their heels, while also showing the ability to change gears quickly, and is very elusive from a standstill (Hockey Prospectus).” So what happened? Taken by the Chicago Blackhawks with the 18th overall pick in the 2012 entry draft (note: the Caps passed up taking him with the 16th pick in favor of Tom Wilson), he spent parts of three seasons in Chicago before becoming more valuable as a trading asset than as a young prospect. In June 2016, after posting 17 goals and 44 points in 115 games with the Blackhawks, he was traded to Carolina with Bryan Bickell for a second round pick in 2016 entry draft and a third round pick in 2017 entry draft. He has been more productive in Carolina, but not as much as his scouting reports might have suggested he would be, recording 24 goals and 71 points in 119 games with the ‘Canes. Perhaps he is turning a corner, though, as he is tied for the team lead in points (29, with Aho), and he is 1-3-4 in his last four games going into the new year. In six career games against the Caps, Teravainen is 2-5-7, even. In the history of the Capitals franchise, seven players finished their rookie campaigns with 20 or more goals. Jakub Vrana has a chance to become the eighth and only the second since the 2004-2005 lockout. In 39 of the 40 games completed so far, Vrana is half-way there with ten goals, the 36th rookie in club history to record at least that many as a rookie. Even if 20 goals ends up being beyond his reach, he seems certain to finish with more goals as a rookie in the post 2004-2005 lockout era than all but Alex Ovechkin (52 in 2005-2006), surpassing Nicklas Backstrom (14 in 2007-2008) for the runner-up spot. Vrana will need to pick up his pace, though. He is without a goal in his last seven games, and his 10:38 in ice time in the Caps’ last game, a 5-2 win over the New Jersey Devils ( a game in which he did not record a shot attempt), was his third-lowest ice time of the season. Perhaps he, like many young players, is hitting a bit of a wall as the season reaches its half-way point. This is one of those things that a player has to learn to manage, to find a way to motivate himself to push through the long winter nights on the way to spring. How successful he is at that could be the difference between joining the “20-goal” rookies in club history and falling short. Vrana does not have a point in his only appearance to date against the Hurricanes. When the season started, one might have thought that the Caps would be a team dancing on the edge of playoff eligibility this season and that the Hurricanes would be perhaps a season away from being a serious postseason contender. 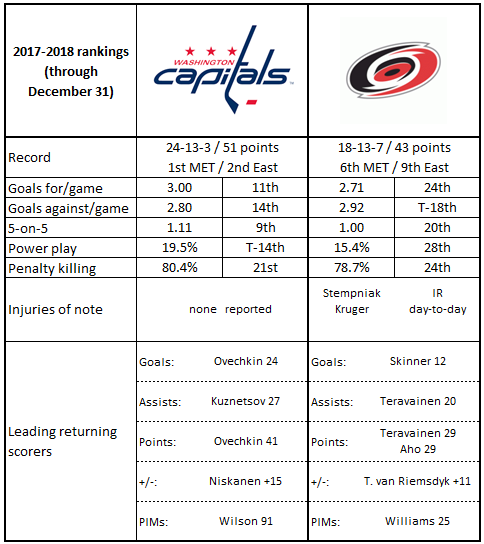 As it turns out, both the Caps and the Hurricanes are teams that fall into the “better than expected” category. Complicating things is the nature of the division in which the two teams play, with still just 11 points separating the top team in the Metropolitan Division (Washington with 51 points) and last place (Philadelphia: 40 points). Carolina is that team dancing on the edge of playoff eligibility, and even this far out from the end of the season it makes for a dangerous team. What makes this perhaps a more dangerous game for the Caps is the welcome dose of home cooking the Hurricanes will have. Only Toronto has played fewer games on home ice so far (16) than Carolina (17). The Caps had better get used to seeing these guys, since they will meet them three times – this game and a home-and-home/back-to-back set of games in the second week of January. Those will be the only Metropolitan Division games that the Caps play in the first two weeks of the new year, so what better way to start the year than putting the upstart Hurricanes in their place as the Caps complete the first half of the regular season?